Yeah, but: Yes, I did intentionally buy the one in camouflage. The Long Version: I own three Op/Tech Hood Hats for my Zeiss lenses, and have been quite happy with them. 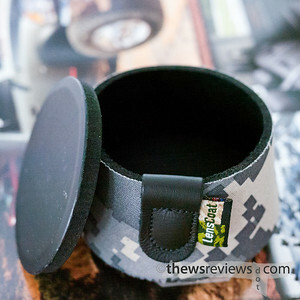 But when I wanted a cover for my Nikon 50/1.4G, I decided that I should diversify a bit, and bought a "Hoodie" lens cap from LensCoat instead. It's a big world out there. Like the previously-reviewed Hood Hat, the Hoodie is made of neoprene and slips over the front of the lens/hood to protect the front element. It's a bowl-shaped squishy external lens cap, and has the advantages of providing a bit of protection from bumps as well as being really, really obvious when it's on the camera. For my rangefinder lenses this means that I can't accidentally take photos with the lens still covered, and for the Nikon it means that I'm comfortable carrying the camera exposed in places where photography isn't encouraged. Hence my choice of camo over plain black: its higher visibility. Why is that so odd? The construction of the LensCoat and OpTech products is remarkably similar; I admit to doing some research to see if they might have been made in the same place, which they are not. However, the appearance of the products is much closer than the 2000 miles between their published factory locations would suggest. The difference is that the LC Hoodie is made of thinner material overall, but compensates with a removable plastic-and-foam disk tucked into the front of the cover. 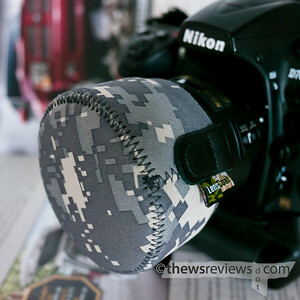 This makes it bulkier than an OT Hood Hat to slip into a pocket when it's off of the camera, but if you plan on using the front of the lens to stop an inbound shuriken, the Hoodie is the one to choose. I do like the idea of these neoprene hood covers. They're pretty much impossible to put on one-handed, but they stay snugly in place while being easy to remove. 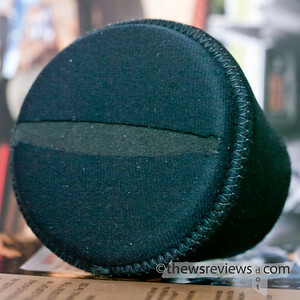 They provide some functional difference from the standard plastic lens caps, and aren't particularly expensive. I'm sure most camera-owners can live their lives quite happily without knowing of their existence, but they're one of those little things that I appreciate. Between the two I prefer the simpler and cheaper Hood Hat over the stiffer LensCoat Hoodie for my small lenses, but I was willing to pay a bit more for the CadPat-inspired 'digital' camouflage over the old analog styles that Op/Tech offered. If I was looking to cap a larger lens, then the plastic stiffener would matter more than pocket-ability, so my preference would be reversed. It's good to have options.